Rateb Jabour, the coordinator of the National Committee against the Annexation Wall and Colonies, said the soldiers handed Ahmad Mahmoud al-Hamamda, four military orders preventing him from entering his land. He added that the area in question is five Dunams, located east of Yatta, and said the soldiers informed Hamamda that he has 45 days to completely leave the lands. 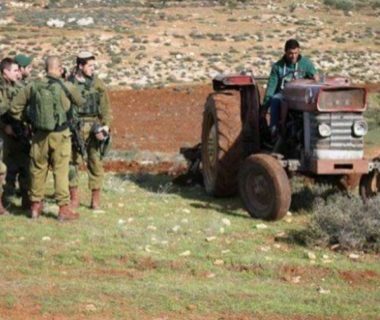 It is worth mentioning that the military already confiscated large areas of Palestinian lands, in Yatta, under various allegations, including the claim of “state land,” grazing land, or by just announcing they will be used for military purposes, including live-fire training. Some of the lands eventually end up becoming outposts used by the illegal colonialist settlers. In related news, the soldiers invaded Beit Ta’mar village, east of Bethlehem, and handed Nayef Zawahra a military order instructing him to stop the construction of his 120 square/meter home, allegedly for being built without a permit from the Israeli Civil Administration.